Photo of the Week.. 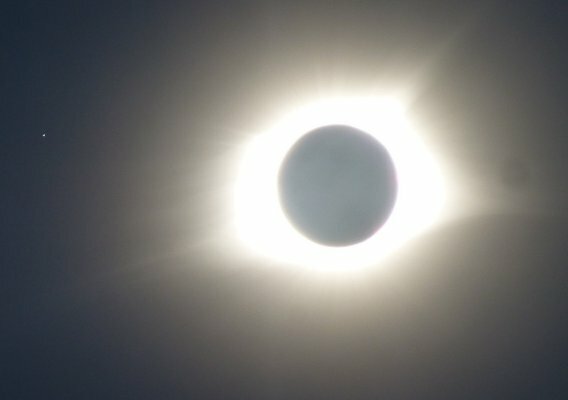 The Great American Eclipse of August 21, 2017. The dot to the left is not a flaw but the star Regulus of Leo. Clear skies and thanks to Skylights' reader. Go to STARS for previous stars of the week. Last week's Skylights is still available. Access Skylights' Archive and photo gallery. From the Sun to the Stars: the OLLI Lectures provides a linked, illustrated introduction to astronomy. The Constellations has a linked list with locations and brightest stars. Constellation Maps show the locations of the constellations. The 172 Brightest Stars lists them through magnitude 3.00. For more on stars and constellations, visit Stellar Stories. Tour the Milky Way. Watch a total eclipse of the Moon and an annular eclipse of the Sun. Moon Light presents scenic photos of the Moon. Go to MoonScapes for labelled telescopic images of the Moon and other lunar information. See the Moon move and pass just below Nu Virginis. Watch planets move against the background stars. See a classic proof of the curvature of the Earth with a "hull down" series. Visit Measuring the Sky to learn about the celestial sphere. Admire sunsets, rainbows, and other sky phenomena in Sunlight. Read the illustrated Day Into Night on the phenomena of the sky See the The Aurora and the Midnight Sun. See and understand the ocean tides. Enjoy Our Complex Universe: A Human Understanding through Art, with 12 illustrations. Advances in Astronomy, 1989-2011. Take a ride aboard Asteroid 17851 Kaler (1998 JK). Look for Books about the sky and stars. Support science literacy by joining the Astronomical Society of the Pacific, an international organization that is among the world's premier providers of astro education. Get Mercury and a variety of other benefits. Presenting three audio courses with 70 to 100-page study guides, narrated and written by Jim Kaler. Heavens Above: Stars, Constellations, and the Sky from Recorded Books. Astronomy: Earth, Sky, and Planets, is available from Recorded Books. Astronomy: Stars, Galaxies, and the Universe, is also now available from Recorded Books. Enjoy Our Complex Universe:A Human Understanding through Art, with 12 illustrations. Read "Heaven's Touch: From Killer Stars to Seeds of Life, How We Are Connected to the Universe," Princeton University Press, now in Chinese translation. To learn about stellar spectra, read STARS AND THEIR SPECTRA: An Introduction to the Spectral Sequence, Second Ed., with two new chapters and 140 new illustrations, Cambridge University Press (UK or North America), 2011. Live in town? Read FIRST MAGNITUDE: A Book of the Bright Sky, World Scientific, 2013. See the interview with Jim Kaler. NEW! Read Dust to Dust in Stellar Stories. NEW! From the Sun to the Stars: the OLLI Lectures, which provides a linked, illustrated introduction to astronomy. IT'S HERE!, From the Sun to the Stars by Jim Kaler, World Scientific, 2016, a new book based on From the Sun to the Stars: the OLLI Lectures, which provides a linked, illustrated introduction to astronomy. Dear Reader: After some three decades of writing about the sky, I have decided to call it a day. Age and health have caught up with me as it does even to the stars, and it is time to retire this column. The Star of the Week/Fortnight/Etc. will continue unabated. It has been a true joy to write to you.